Buck Snyder was born in 1896, in Tornio, Finland. He came to America at an early age and was never sure how he got the last name Snyder, as his father’s was Hallonen. However, he was called Buck or Bucko even as a child. He lived most of his life at Ash Lake near Orr, Minnesota, and was well known in trapping circles, especially from the 1950s through the 1970s when he sold trapping methods and a predator bait formula. Buck’s passion was trapping timber wolves. He loved deer, and he figured that for every wolf he trapped, 25 deer would live a year longer. On page 42 of the November 1957 FUR-FISH-GAME, there is a picture of Buck with 12 wolves trapped that day; a Ford Model T in the background dates the photo. It was said that Buck never learned to drive and his lifelong friend Lucille Stigman drove him to a trapping area, dropped him off, and then picked him up down the road after he had checked several traps in between. Buck also made or at least assembled wolf and beaver traps. The wolf trap measures 19 inches end to end with off-set jaws that measure 6-1/2 inches post to post and have a 5-inch closing height; the beaver trap has solid jaws with the same spread but a lower 4-inch closing height. Both traps are dogless with a small 1-3/8-inch pan, Buck’s trademark. 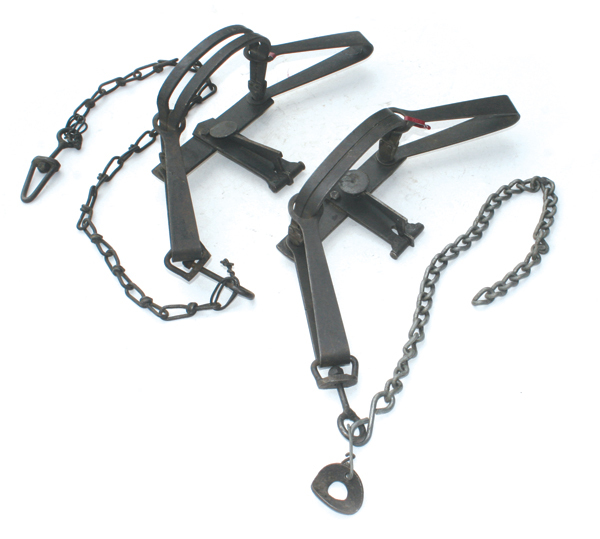 The springs on both traps appear to be No. 4 ATC Newhouse, and the beaver trap in my collection has a drowning washer. Buck passed away December 1, 1986, at the age of 90. Current collector value for a Buck Snyder trap in good condition is in the $200 range, in my opinion mainly because of the few known to exist. The traps are not marked, and nobody knows how many were made. But the small pan is the dead giveaway. I suspect a few more will surface following publication of this article, as the odd trap hanging in the back of the fur shed finally may be identified.